I’m not sure where the hobby ends and the addiction begins but I haven’t found a 12-step program that will help when it comes to my chickens. From the show-quality purebreds to the mutts, big and small, I love them all. Jukie and Roz, my speckled beauties, purebred Mille Fleur d’Uccles. These lovely ladies were my lap-chickens. They would seek me out, even if that meant peeping through my bedroom window, preferring to be with me than with the other chickens. Although Kitty the rooster was never my biggest fan, even he would tolerate being handled with minimal protest. I see my chickens as yard art, all the bright colors and pretty variations, no two exactly the same. Which is why I don’t focus on a breed. It would be like watching just one episode of Gilligan’s Island over and over, never seeing the rest of the series. Think of all the awesome characters you would miss! I breed many of my own chickens, which is my way of saying I let nature take it’s course, I keep a few roosters and a whole lotta hens and, viola! Hatching eggs for the incubator. Most years I hatch about 400 chicks. Many from my own coop and some I get from friends to keep the gene-pool nice and deep. No sense wading in shallow water when you can broaden your horizons and open yourself up to new and unusual combinations of breed and color. A few years ago I discovered Icelandic Chickens. These awesome little birds are direct descendants from the viking flocks. 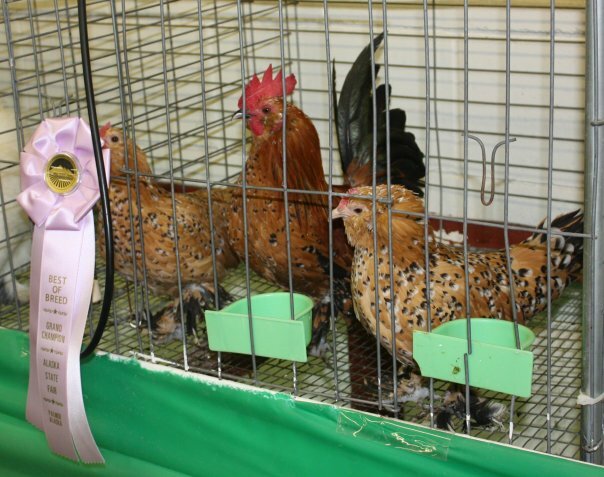 Thought at one time to be extinct, these beautiful chickens are making a comeback! Unlike other breeds, the Icelandic Chicken does not have a standard look. They come in all colors, shapes and sizes. They lay white eggs and are very efficient foragers with excellent feed conversion. do you have any organic (processed) turkeys available for Thanksgiving? Not at this time. We don’t feed organic feeds, we feed clean, without added medications or growth enhancements, but we don’t pay the higher price for the word “Organic”. The turkeys we have should be laying soon and will be kept to brood chicks.